Annotation: Enjoy an unprecedented, in-depth look at our 50 states, starting with the 25 listed here (remaining states will be available in Fall '04). 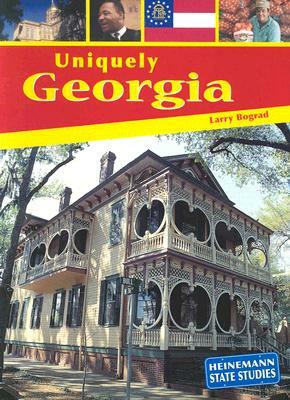 Each "Uniquely title offers readers narrative descriptions, charts, graphs, maps, and biographical sketches, and provides a complete picture of each state--its industry, climate, history, native peoples, ethnic groups, native and endangered plants and animals, and many other unique facts. Each book in this series includes an assortment of facts about the state, including geography, history, government, and culture. The texts are so full of generalizations as to be almost useless: "Wyomingites' favorite food is beef." The supporting stock photos are often unconnected to the text. Reading list. Glos., ind. [Review covers these Heinemann State Studies titles: [cf2]Uniquely Georgia[cf1], [cf2]Uniquely Wyoming[cf1], [cf2]Uniquely Alaska[cf1], and [cf2]Uniquely Maine[cf1].] Copyright 2005 Horn Book Guide Reviews.